The New York Islanders were crowned the Islanders Cup Match champions but needed a Shootout to do so over the Bermuda Hockey Academy Islanders. The match ended 1 - 1 at the end of regulation, which then saw the game go to a penalty shootout it was 3-3 at the end of penalty out of 5 each, it was then down to sudden death. Unfortunately on the first play of the sudden death Bermuda missed and then New York scored theirs to win. Machail Ming-Woodley game the Bermuda Hockey Academy islanders the lead in the 11th minute scoring from a Penalty Corner. 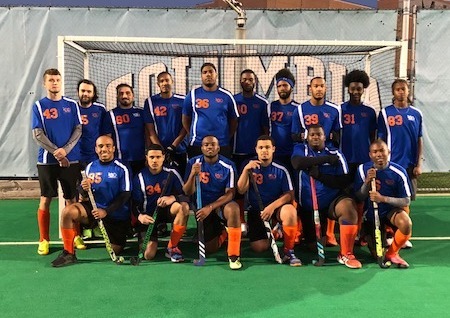 Just when it would seem as if the Bermuda Hockey Academy Islanders would grab the win, the New York Islanders scored with 40 seconds left on the clock from a Penalty Corner goal off the stick of Noel Samu. After 3 penalty corners it was 3-2 to the New York Islanders with the New York Islanders shooting first, this meant if they scored on their fifth corner they would win. Instead Bermuda Hockey Academy Islanders goalkeeper Zahyinde Lightbourne-Cann made the huge save to keep Bermuda in the game. Next up was Donnie Simmons who had to score to keep Bermuda Hockey Academy Islanders in the game. As he was taking his penalty shootout he was foul by the goal keeper and was award a Penalty Stroke which saw him convert to level the score at 3-3. After five penalty shootouts it went to Sudden Death with Bermuda going first. Hemijah Bean step up for Bermuda and beat the keeper but slipped and was unable to push the ball into the goal, up stepped Ellis Chance for New York who beat the keeper after a spin move slotted the ball home for the win.